Wintertime is the time of soups and homemade breads. Lots of baking is done here when it’s too cold outside for much activity. Really makes you feel good to see the smiles that homebaked goods can bring — unless too many calories are slipping down the hatch. Let’s just say that we’re looking forward to the activity that Spring will bring! It’s only six weeks away on the calendar, but greenery will be starting to show before Winter has completely left us. Before the big snow storm is to hit we’ve got firewood and kindling, food and water for several days on hand. Haven’t had much in the way of winter weather yet this season, so maybe we are due. For something unusual in the dead of February, I picked a handful of chives on my way to the mailbox. Snow is nowhere in sight – just on the weatherman’s forecast. Tonight, I’ll have some wild, fresh herbs to flavor the dinner meal. Back in the kitchen I snipped the long ends of the green chives and gave them a rinse. The clean chives were set aside until the cooking was done. Just before serving dinner I used scissors to snip very short pieces of chives on top of the mashed potatoes. A few twigs of oregano from last growing season were tied together and now hangs in a corner of the kitchen. Holding a plate under the dried herb, I crushed a couple sprigs with my fingers and let the plate catch the falling pieces of now aromatic oregano. Mint, basil and rosemary are hanging in the same fashion. Olive oil was drizzled over the chicken breasts, with a pinch of salt and pepper and a couple pinches of the crushed oregano on top. Chicken was baked in a covered casserole dish until done. The meal was rounded out with whole baby green beans and applesauce. Dinner smelled and tasted terrific! Chives is our only herb harvested fresh outside during winter. We have chives growing wild here all the time. It may be one of the few plants that is hardy enough to keep going during the cold of winter. Certainly, in the northeast or mid-atlantic states chives is one hardy herb. 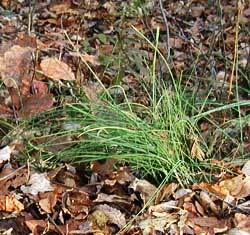 Chives grow close to the ground and may be shielded by the fallen oak leaves all around them in our woods. In the fields grazed by cows you can see clumps of chives that the cows have not consumed. Perhaps they don’t like the taste, or would simply rather eat the grass. In any case chives have a delicate flavor that is destroyed on heating. Make sure to add chives to your potatoes, noodles, or any dish just before serving. Any dish with sour cream is begging for a little chives! Try some chives tonight!